The future site of Bakerie. Photo Rachel Holiday Smith. Inset: Daniel Branover. 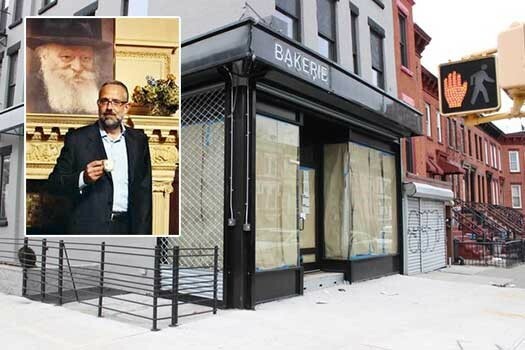 Daniel Branover, owner of dairy restaurant Basil, is planning on opening a new kosher bakery – called Bakerie – on Albany Avenue. 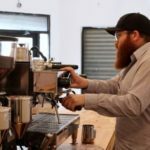 This new venture into another area of the food business comes along with another plan on his to open a meat restaurant – called Meat. A new kosher bakery is coming to the neighborhood this summer, bringing “finer baked goods” to a renovated Albany Avenue storefront, its owner said. Isn’t that one of the main reasons we keep kosher in the first place, to have a divide between those who keep kosher and those who don’t? Unless of course he’s referring exclusively to Jews who don’t keep kosher yet. why does he “use” the Rebbe’s photo in his ad? it’s really not correct – and makes it look like he is endorsed by chabad or worse yet, the Rebbe. where are the Rebbe’s chassidim? but what of our Rebbe’s chassidim? Seven dollars a loaf? Who wants to pay that money for a loaf of bread? If im not mistaking the reason why our sages forbid us to eat “cholov Akum, and “pas Akum ” was for this precise reason – to NOT eat together with NON Jews. Jews for hundreds of years went to great lengths to keep that. how does this guy have the Chutzpah to say this ?? Reading the above comments got me thinking a couple of things, first off, one of you asks why there is a rebbe picture in the advertisement? that would be false. There is no picture of the rebbe in his Ad but rather it has to do with the picture the editors of this fine website has chosen. is it a sin to make kosher food good and on a professional leval witch is lacking tremendously In the kosher world? Is it bad to make food so good that everyone wants some even toughs that are not required to eat kosher? Who would pay 7 dollars a loaf? One of you asked, well to answer your question it certainly seems you won’t, that being said no one is being forced to by there baked goods there, so why are all you folks making it sound like there is going to be a Armageddon in the neighborhood? Maybe wish this man success on his endeavour? Why so negative? Can it be jealousy? It sure seems likely. You honestly don’t understand what the complaints are about? you know that the comments are all correct. When the liberals don’t like something they resort to name calling .. in your case you accuse the commentators of jealousy – is that the best you can do? I am heartened that we still have people who understand who we are and how we are supposed to behave. here you are asking us to risk losing neshamas so someone can sell “fancy” bread? And you can’t understand the concern?? can a frum jew really say this ? He’s talking about the mingling of those that eat kosher and those that don’t, did you consider all the Jews who do not yet eat kosher and now have a good reason to? What’s wrong with a specialty bakery that will also serve to bring those who do not eat kosher yet to eat kosher? Mr breaking bread, can you please bring forth a source for your claim that the reason for keeping kosher is to, as you say “to have a divide between those who keep kosher and those who don’t”? Here’s one source.There are others. The point being that if we break bread with Gentiles it can lead to the proverbial “mixed dancing” etc. Most takonos of Chazal regarding stringencies in food, like bishul Acum and Pas Acum, were established to keep Jews separate from other nations. It is fine to open a bakery, but not for the reason of undermining what our chachomim strove to achieve. Nobody has a problem with a good Kosher eatery, or for a fellow jew to make a good living. The issue here is , if his intention for these establishments is to have jews and non jews eating together – which he keeps on saying in each interview – then that is exactly why our great rabbis forbid us from eating Chalav akum and Pas akum, so as not to break bread with non jews. The % of envious dimwits among us never ceases to amaze. And to top that off, these people call themselves Chabad! Of course the irony of that is lost on them. You amaze easily which signals serious dimness of wit. But you are correct in that nothing quite says Chabad like ‘Meat’ and like people who are not foodies but appreciate good food. This is what’s of left of business in our day and age, whereas the previous generation had textile factories, our industry consists in creating eating experiences. But it *is* unbecoming for us to react to outward symbols of cultural decay, which we now absurdly call ‘progress’ with anything more subtle than hatzlocha Rabbah! you go girl! so we are all indebted to the formidable intellects like you who drop in from time to time to remind us to stay true to our origins, lest we ever forget that Chabad means MEAT. What does it mean to be Chabad to YOU (personally, in your own words please)? To “Chabad”: Yet another mental giant. I was clearly not talking about what it “meant TO BE Chabad” at all, but rather noting how ironic it was that so many manifestly stupid people identify themselves with “Chochma, Binah, and Daas”! Get it? The progressives will destroy every sane comment section in blogdom if you let them, maybe we spend too much time ‘surfing’ the internet, anyway. We are all stupid. (The weasel will claim that it never said *all*, which is true, it’s just an amazing ‘%’.. don’t buy it — it’s just rhetoric – it’s what weasels do. So an insult, that it repeats in different ways a number of times, and trivial logically conclusion that follow from the insult. And that is all — its sum contribution to this discussion thread. This creature is well trained. It hangs out on the left side of blogdom where this style of rhetoric—the rhetoric of communication war—is par for the course. Unchecked, this warpath rhetoric—it is increasing on this blog–will destroy this comments section and others like it, which in the grand scheme of things doesn’t rate much, but is not in line with my preferences. for one. So Moderators: take note of the contribution, and think long and hard, if the intent (or effect, because these creatures are usually far too shallow to work at the tactical level) is healthy for the blog or not. 1. Insults — lots of them. That is their only weapon. They aren’t interested in saying anything. They want YOU to stop saying things and the way they go about doing that is by instiling fear. No one likes being insulted, even anonymously. That’s what the ‘genius’ and ‘another mental giant’ is all about. 2. Trivial points that cannot be assailed without rejecting the underlying assumptions. And to reject the underlying assumptions is ‘victory’ for them because you’ve implicitly given validity to the claim ( giving status of warranting a rejection). That’s what the ‘how ironic it was that so many manifestly stupid people identify themselves with “Chochma, Binah, and Daas” is all about. The only way to attack that is by addressing whether you are in fact stupid or not, which is the same as answering the classic ‘when did you stop beating your wife’ question. 3. This is the most subtle point: this creature may be Jewish because it slipped and actually sorta kind of tried to make a point. “these quotes are pulled form a piece published in dnainfo which obviously aimed at promoting the new eatery to the general public.” — this indicates some sort of thinking in this creature’s feverish mind, but it doesn’t bother to flesh out the argument (often this is due to cowardice, because you can claim you’re smarter than everybody else right up until the point where you actually make arguments that people use to evaluate where you actually stand on the ladder of intellect, which is why smug trolls avoid making fleshed out points. At best they make allusions, that you have to divine to challenge which leaves you open to the inevitable ‘see you didn’t understand me…’ As if there was something to understand. There is no problem with having higher quality bread. how MEGUSHEH have we become??? 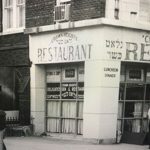 When the Rebbe was here Bgashmius where did we see this megushimkeit of noch fresirei and Noch and Noch…. where has our aidelkeit gone.???? Do we need the yuppies coming and buying bread? it is not about, what is opening up but for what reason.???? Let us not test der Aibishter and show him we need more up scale bread, not Cholilah for health reason or allergies like Celiac that special bread is needed. sort of bread we make a the Heilike Brocha Hamotzi lechem min Haaretz!!!!! Genug Mit di Fargrebkeit!!!! Vu hin Zene mir farkrochen???? ?Rateveh unzer future Dor!!!!! Hatzlachah Rabbah on your new enterprise(s). I don’t pay seven dollars for a loaf of bread normally, but I look forward to tasting yours. It will be nice to have another eatery in Crown Heights. The only non Jews who dine in Basil are ones who are meeting Jews and they would be mingling regardless. The mingling comments get the place a lot of publicity which brings other yiden from all over NY to Crown Heights. These visitors are likely to support other establishments in the shchuna. People should stop getting bent out of shape because from some comment by a guy trying to get some publicity. Also, believe it or not others read these comments (see comments on DNA info) and it makes a big chilul hashem. Who says it’s for non-jews? He said it’s for the non-kosher consumer and the kosher consumer. I would think Danny means that it’s for yidden who are used to upscale eateries (non -kosher R’L) who we, kosher eaters, can ‘break bread’ with (read: connect with and have a good hashpo’ah on) now on the level that they are used to. And, it will be in a kosher ‘bakerie’ ! I’m so shocked at the dumb comments. Rebbe this, and Rebbe that… all you higher than thou sitting on your armchairs commenting. When you WILL act and perform as the Rebbe wants THAN and only then can you give your advice. Until then more and more here staying turn a deaf ear to you and your groupies. I am betting based on your comments and the graceful technique in relaying these thoughts that you are the ones that give Chabad a sour name by acting like idiots. Hopefully you remain just a few. Daniel, good move, thanks for making CH a great place to stay amongst the many reasons we have here in the schuna, and into the 21st century. Basil will always be a hit. These two additions are a huge plus. Being there are many reasons to run as we see from a perfect example, some of these imbecile comments here. Great post – great news, hatzlocho!!!! Please see what I wrote above, a primer of sorts, that I will update as we go along. This creature is different. I don’t think it’s as ill-willed as the above. Everyone has a legal right to what’s legal, which is why nobody is ‘calling’ for any entity to ‘step’ in a ‘do’ something about this, but we do need to state, for the record, what we believe to be decadent. Our family doesn’t eat these fresser places because it’s past nisht. It’s true: in the modern world, past nisht is superstition, but those among us who carry forth the human visage into current times and beyond will not be deterred no matter how many monkeys throw poo. With houses in the millions why can’t bread be $7???? We are attracting the hippies from Park Slope and its taking over our shchuna. Go away, take your crazy upscale expensive restaurants, bakeries and meat store some place else!! STOP spoiling our Crown Heights, FEH!!! We want the neiberhood to be like the old days, cheap with dirty restaurants and riddled with crime. Wow what original names!! Did he get the idea from the person who invented the fireplace? A restaurant does not need all of its neighbors to patronize it. Wholly bizarre, unsightly xenophobic, and very plainly outside the realm of your business (literally). I’m a ghast at the small mindedness and keen ugliness of fellow human beings. If you do not like standing next to a gentile in line for bread, well then this whole living in a civilised culture thing may just not be for you. Which is fine, and mostly your business.